Mid-July to Beginning August. Pruning encourages sprouting even during fairly low temperatures. Newly sprouted leaves are tender and could be burnt by late frost, in which case nothing is gained and important stored reserves are lost. We prune roses to maintain the shape of the bush, to keep the main branches to a manageable height, and to eliminate unsightly dead wood. 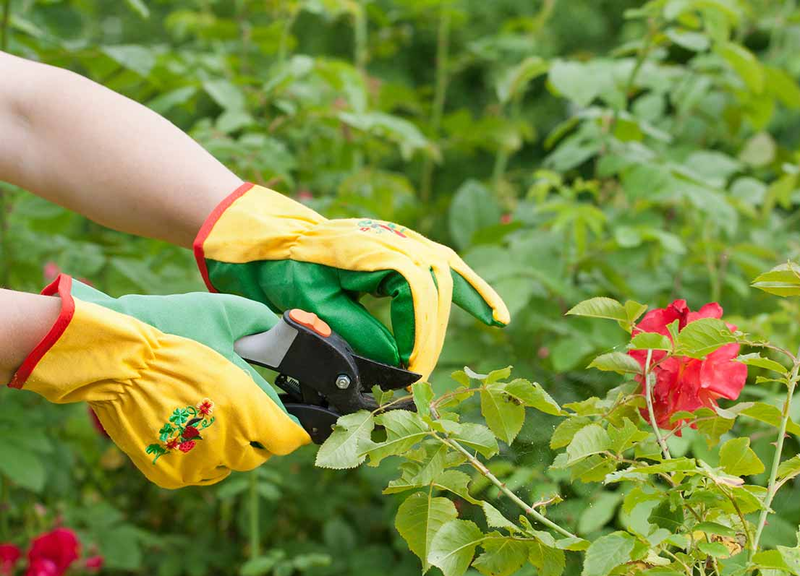 Pruning encourages strong new growth and reduces the number of flowering stems, resulting in an increase in flower size. It also allows sprays and sunlight to penetrate the centre of the rose bush and allows for better air circulation which is essential in the prevention of diseases. 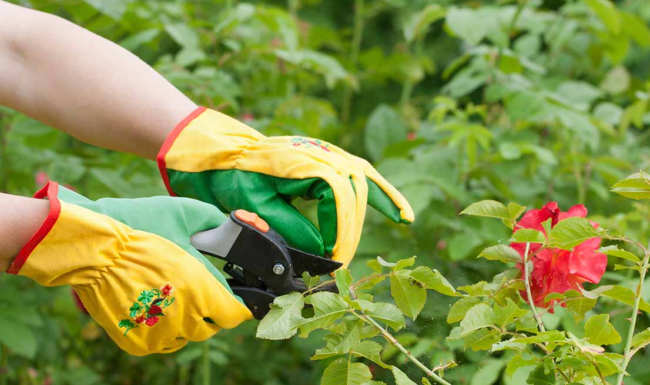 Ensure that your secateurs and loppers have been sharpened and sterilized before you start pruning. You do not want to transfer any diseases from plant to plant. Take a good look at your rose plant and identify four suitable stems that are more or less neatly arranged in opposite directions. Make sure that there is no rootstock growing from the shank of the plant. One is able to identify this as it looks different to the hybrid rose. It also contains 7 leaves whereas a rose only contains 5. This rootstock is what the hybrid was originally grafted on to and will take over your plant if it is not gouged out with a sharp knife. Be careful not to remove any basal or water shoots that are emerging from the bud union itself. These are a sign of fertility and will later harden up to become a main stem of the rose bush. Once you have identified the 4 main stems remove all other stems and branches. Remember you want to shape your rose bush like a tea-cup or vase to create an open centre for air to circulate and for the sunshine to reach so remove all spindly shoots (anything less than the diameter of a pencil), dead shoots and any die back from the base of the plant and any branches that cross over one another. Always cut to an outside bud about 1cm above the outward facing bud due to any die-back that could take place and cut at a 45 degree angle for water to run off. Roses have apical dominance. This means that as they sprout the hormones flow upwards to the top of the plant and concentrate on making the buds at the top of the rose bush sprout. Do not worry about pruning lower than these sprouting buds as the lower buds are just as healthy they have just not sprouted yet due to being lower down on the plant. Once the remaining stems have been pruned to the specified height, any side branches on these stems should be cut off smoothly next to the main stem. If any of the main stems are forked, remove one twine of the fork. All old leaves and mulch must be entirely removed from the bush and placed on the compost heap. If your plants have scale or had bad infectious diseases or pests such as aphids, red spidermite & mealey bug the past season, then spray with Oleum while still in a dormant state before the plant starts to grow. Directions: 100 ml Oleum diluted with 10 lts water to spray or paint onto infected area if plant is starting to shoot. No two rose bushes are the same so adjustments need to be made but it does get easier and easier all the time. Roses are very forgiving – the pruning method or severity really does not matter much. Good rose growing is about the care they receive during the growing season because that determines the well-being and performance of your plants. Watering, feeding and mulching should commence fairly soon after pruning has been completed. Food for thought: ‘Remember, the worst cut is the cut not made’. These Rose tips are courtesy of Tarr Roses.